Don’t you just hate it when the shoebox that came with your shoes are either too big or too small they eat up so much space in your cabinet? Or when the shoebox is already too flimsy and tattered it looks like a rat lived in it? Well. you can always throw these shoeboxes away and just store your shoes on a shoe rack or inside a cabinet. But then again, they can get dirty easily and molds might even form. Eww. Solution? Acrylic shoeboxes from Howards Storage World! They’re my preferred shoe storage solution! I swear i love these shoeboxes! First of all, no more time wasted opening and closing each shoebox, desperately looking for that pair of shoes. No more worrying over shoes getting dirty and deformed on your shoe rack or inside your cabinet. Acrylic shoeboxes are convenient and not to mention, chic too!!! You don’t even need to hide them inside cabinets! Just stack them up and voila! Follow me on Twitter and Bloglovin’. Like Howards Storage World on Facebook. Contest is open to Philippine residents only. Deadline for entries is on May 30, 2012, 11:59 PM. No multiple entries please. Entries will be shortlisted based on the answers. Out of the shortlisted entries, winner will be chosen via Random.org. Good luck everyone! FYI, Howards Storage World is available in Shangri-La Plaza Mall, Robinsons Ermita and soon at Greenbelt 5. I need to win the Howard shoe storage because I am an organization fiend who has been on the lookout for the perfect shoe organizer to house my teenage daughter’s footwear that are perennially on her bedroom’s floor. My search finally ended when I chanced upon the acrylic shoes containers at Howard’s last year but when I returned to purchase them, they were no longer in stock. Winning the 5 sets would jumpstart the collection of more acrylic boxes to accommodate her growing shoe collection. Why do I deserve to win Howards Store World Acrylic Shoeboxes? I deserve to win Howards Store World Acrylic Shoeboxes because our messy place needs a quick makeover. We are five female cousins living in a small apartment. It is hard for us to store our things due to limited space. Right now, we just try to fit two pairs of shoes in one carton box. This deforms our shoes but we don’t really have a choice. These pretty shoeboxes would greatly help us improve our lives when it comes to organizing stuff. It is very convenient for on-the-go ladies like us. Moreover, the chic designs would be a beautiful replacement to the our old eyesore shoeboxes. Why do you deserve to win Howards Store World Acrylic Shoeboxes? I deserve to win because I want to turn my unorganized shoes into clever storage which Howards Store World has.With this shoesboxes, I can now protect my shoes and store them neatly with these stackable boxes! I deserve to win Howards Store World Acrylic Shoeboxes because I have a ton of shoes but because of the recent flood in our area in Davao my collection has been ruined :( I really need this to help me salvage what I can from my collection! I deserve to win that bec my shoes deserves the care that the Howards Storage will give. I deserve to win Howards Storage World Acrylic shoeboxes. Because I’ve tried those transaparent plastic shoe boxes (bought from online, mall, bazaars and though louse up in 3-5 months) And now, I think it’s time to switch to an ACRYLIC shoeboxes! Fab! I deserve to win Howards Store World Acrylic Shoeboxes because I really care about my shoes! and I think it deserves to be in a better quality like Howards Store World Acrylic Shoeboxes! I deserve to win Howards Store World Acrylic Shoeboxes because there are tons of shoes in the house and our shoe storage is already so old! I want and need to win those shoe boxes to not experience having my shoes in the garbage can again. My mom hates seeing my shoes in the patio so she keeps on throwing them so I’ll just have to get them there. Hope I’ll win. Bye garbage cans, HELLO Howards Store World Acrylic Shoeboxes! I deserve to win Howards Store World Acrylic Shoeboxes because it makes our shoes be organized and look neat in our room. Organized things helps you protect your shoes to make it look as good as new. I deserve to win Howards Storage World because I’m planning and already started to widen my shoe collection. I wanna give my babies a warm welcome by having this perfect shoe storage! I deserve to win Howards Store World Acrylic Shoeboxes because I want to make three (four including myself) happy. They are my roommates for almost 6 years. And for our last school year together, I want to give them something extraordinary. We have problems kasi organizing our footwear. Our dorm matron always reminds us to clear the area under our beds (where we put our shoes) because the ate’s of the dorm don’t want to clean cluttered areas. Stacking flimsy shoeboxes is not good enough since it will only fall down. Finding the right pair has become a problem too. Sometimes, I have to go down the floor to peek under the bed to find the other pair. Since the acrylic boxes are clear and sturdy, we can stack them all up in one corner of the room (maybe we can use it as a display too! Haha) without the hassle of opening all the boxes just to find the right one. i deserve to win because i really love shoes and any footwear.. I deserve to win Howards Store Acrylic Shoeboxes because I want to protect my shoes just like they protect my feet and complete my outfit. Shoes are a girl’s “sole”-mate, that’s why I want to keep my shoes organized neatly so that I can use them for a long period of time.Keeping it in regular shoeboxes can be a hassle especially when you’re in a hurry.Like what Ms. Camille said,a lot of time is wasted opening and closing them. I want my shoes kept in a neat,chic,and convenient storage.Only, Howards Store Acrylic Shoeboxes can help me do that. I deserve to win this Howards Store World Acrylic Shoeboxes because i love its remarkable and simple style that can allow my shoes to securely stock in such a creative, innovative and outstanding quality shoeboxes. Looking for the pair of shoes that go with the outfit one’s wearing is always a cause of confusion in the small room my sisters and I share. And it doesn’t help that oftentimes we find that the shoes we love go to an early retirement due to the lack of proper storage. I believe that keeping our shoes organized with these acrylic shoe boxes would be a great start to a more chic, orderly and sustainable lifestyle. I/my shoes deserve to win this because my shoes have served me well and they need a nicer container to stay in. Besides, for a person as OC as I am (with a limited budget) this would somehow help me organize my shoes better rather than just piling up (and mixing up) shoe boxes. I need to win those acrylic shoe boxes because my babies (shoes) need TLC! After all, good shoes take you to good places! I deserve to win Howards Storage World basically because I am inspired by how some fashion bloggers keep their shoe collection in their rooms! :”) ♥ I was thinking how could I choose the right shoes to wear without hassle looking those shoes one by one with the box and to keep my shoes without being deformed when they were out of it. Also, I want to keep them in my room with me being able to see my shoes even when I am just lying on my bed/reading books ( to serve as my inspiration) =)) Hehe. Because I’m about to redecorate my bedroom, and I’d like my shoes to have a significant part in the room, and not be stowed away in my dark shoe closet. I want them to be displayed in the open, so I can admire them every day! I deserve to win Howards Store World Acrylic Shoeboxes because I love shoes and I need to start taking care of them! I don’t have a lot of budget to buy shoes every now and then so I buy classic pieces, the problem is I don’t store them properly and they end up looking old and worn-out. These storage boxes will really be a big help! I deserve to win Howards Store World Acrylic Shoeboxes simply because, my shoes need them! :) It’s like a heart that needs L-O-V-E! naks! I deserve to win these cute shoe boxes from Howards Storage World because I love to organize my things and I have many shoes. I need to keep them organized and with these stylish boxes, it will keep my precious babies looking good and new while keeping my room organized. I deserve to win Howards Store World Acrylic Shoeboxes because I love my shoes. It hurts me to see some either in their boxes or stuck in my old shoe cabinet. Shoes need some lovin’ too, and I know that they would be well-kept in these acrylic boxes. Well, I deserve to win Howards Store World Acrylic Shoeboxes, because I think that I need those kind of boxes so that I can organize my shoes well. And these shoeboxes would really be helpful and useful for me so that I can keep my shoes away from dust, dirt and also from liquids. Answer: I deserve to win Howards Store World Acrylic Shoeboxes because I don’t own many pairs of shoes and that’s why I wanna keep the ones that I have last forever! (that’s how much faith I have in those shoeboxes) and fashion is always cyclical so I’m not worried that my shoes will ever be out of fashion. So there you go : thrifty but stylish! I deserve to win Howards Store World Acrylic Shoeboxes because I really want it and need it so badly. It would be a great help in organizing and protecting my shoes. I deserve to win Howards Store World Acrylic Shoeboxes because my shoes deserve a better home other than under my bed. Name: See, Kristin Abigail P.
i tend to forget i have these shoes because i can`t see them all in their shoeboxes.. then when i remember i have them, i see that its paint’s starting to chip off even if i barely used it. it’s heartbreaking !! if i win the howards store world acrylic shoeboxes then my problem will be solved ! I deserve to win the Howards Store World Acrylic Shoeboxes, because I WANT and NEED it so bad. I am just living in a small unit and that chic and sleek shoe organizer would be a great help, or better yet, the solution to my spatial problem. :D Thanks, Miss Camille! I deserve to win Howards Store World Acryclic Shoeboxes because I grew up without a shoe rack and the shoe boxes that come with it were always thrown in the garbage or used for other purposes. Because of this, my shoes would always end up getting dirty even if it’s just placed in a random corner because some spider would make it as their home and dust gets accumulated. Moreover, having no permanent place, it’s always getting kicked at and one or the other gets lost (especially during that Sendong typhoon) and that would make a complete mess. We owe a lot to our shoes since give they give extra oomph to our outfits and even exude confidence; it’s about high time to return the favor by getting these boxes and give them a sturdy and safe home. I deserve to win Howards Store World Acrylic Shoeboxes because my babies (shoes) need a home. :) After a tiring afternoon or an event they need to be take cared of by having a nice place to stay. My shoes can’t stay pretty forever if I don’t store them properly. I prefer storing them in individual shoe boxes/containers instead of placing them all together inside shoe cabinets. This way, they don’t get deformed and dirty easily. It would be convenient for me to organize my shoes with HSW shoeboxes because it’s clear and it’s like a drawer. I don’t have to take each one down just to get a pair which is at the bottom of the pile. Btw, I just earned a bachelors degree last month and turned 23 this month. It would be nice gift if ever I will win those shoeboxes. I deserve to win Howards Store World Acrylic Shoeboxes because instantly, upon reading your blog, I wanted to create a clutter free room! So i’d take advantage of every available storage opportunity. Right now, my shoes are scattered in every imaginable places! (think under the bed, closet cabinet, under the tv rack, argggh!) And I just have to agree that its sooo time-consuming to find each shoe, going through all shoeboxes (im close to taking pics of each just to sort them out!) And just when Im about to wear it, i find molds! ewww. Camille, please please give my footsies a good home. I deserve to win Howards Storage World because I really want this for a long time, I can’t afford to buy one. I need this so that my shoes will be well organized. i deserve to win because for the love of shoes, I just want to take care of my shoes. Great things should be taken care of! I deserve to win those shoe boxes because I am a self-confessed OC and nothing makes me happier than seeing everything in pristine order, which is why these gorgeous shoe boxes from Howards Storage World are perfect for me and my babies. Shoes, next to diamonds, are a girl’s best friend and these pairs of stylish investments need a special storage treatment. Well, mine definitely needs one, and since I’m sharing a shoe closet with the whole family, my shoes can use Howards Store World Acrylic Shoeboxes–a chic barrier from brother’s basketball shoes. Also, clear shoeboxes means lesser time for me to choose shoes for my outfit. i should win those Howards Store World Acrylic Shoeboxes so that my shoes will be more organized than being just cluttered under my bed. With these acrylic shoe boxes, I am sure that the termites won’t attack them anymore. It’s hard to keep everything in place when you have a toddler running and playing almost 24/7 in the house. Well, it’s just one of the many responsibilities you have to keep up with when you become a mom. As for me, it has been one of my everyday dilemmas to prevent my kiddo from playing with his Dad’s shoes. He just won’t stop exploring everything that he sees. And most of the time the more you tell him not to touch something the more he pursues it. So, after finding out about this blog giveaway, I immediately just have to take time to join. This will definitely help me maintain our shoes on it’s proper place and keep our shoes at it’s utmost quality. Definitely something that would take one less worry off my back. There, so I really hope I win. After all, what’s a family of shoe fetish without it’s fabulous shoe rack. I love shoes! I appreciate good looking shoes! So whenever i see a pair that i like, i buy them right away. Now because of my love for shoes i ended up with a problem. Now i have waaaay too many pairs laying around the house, scattered and unorganized. I bought a shoe rack from the public market(lol) but it really didnt look nice and still looked cluttered. So i deserve to win Howards Store World Acrylic Shoeboxes because what better way to organize my shoes while still showing of it’s beauty than with these shoeboxes. Perfect size for whatever shoe’s i got, clear panels to show ’em off and make them look organized and these shoeboxes will add beauty to whatever room i put them in. I need a place to store my beautiful shoes in style….. I deserve to win Howards Storage World because we are moving in to our new apartment by end of this month, with its chic design it can be placed even in the living room to showcase and store my shoes. As simple as that all my shoes and foot wears are scattered below my bed. Honestly, when I need one pair of it I need to use my “panungkit” first to get it. I need to do extra effort to lean on the floor to get it. hahaha Its just that being busy in work I didn’t bother to go to the store to buy one.I save my time to take a sleep and have rest from a long tiring everyday. So i think this time i deserve to win this Shoeboxes. I think I deserve to win the HSW shoeboxes because not only will I use it, so will my mom! Now that my mom and I are the same shoe size, we will be able to keep the shoes we love and share in a place where we are assured that it’ll be safe from dirt and dust! Plus, we can also wear our shoes more often because we can see what we own and not overuse anything! Thanks for the giveaway, btw! Winning Howards Store World Acrylic Shoeboxes will help me preserve the beauty of the pairs of shoes that I have. Shoes are also investments because it takes time and effort to get the perfect pair for your feet. In addition to that, getting shoes are quite expensive if you’re going for the quality that will last a lifetime. Thus, winning Howards Store World Acrylic Shoeboxes will help me preserve my investments and make these pairs of shoes last forever. I deserve to win Howards Store World Acrylic Shoeboxes because I think its time for me to learn my leason, take good care of my shoes, cause they carry me on whenever I go, they have their unconditional patience even I just place them outside our door. They never disappoint me. I want to win those boxes because I won’t be able to wear my lovely shoes as much as I want to come June (school uniforms!). My shoes deserve a better storage. Those Howard Storage World boxes are transparent so even if I won’t get to use them often, I’d still be able to appreciate them just by looking at how they are beautifully stored and protected! I deserve to win this because i am a girl that loves shoes and we all love to take care of our loved ones, such as our shoes, bags, etc. I wanna win Howards Storage World acrylic shoebox organizer because it’s chic, neat and space-conscious. I can stack up these shoe organizer to utilize the small space I have especially that I live in a small condo unit. I deserve to win Howards Store World Acrylic Shoeboxes because my shoes are very much cluttered and I want it to be organized with these amazing acrylic shoeboxes. I would love to win Howards Storage World because it’s sturdy enough to keep shoes in a good condition and it’s transparent so it’s easy to find the shoes you need. keeping them in shoe boxes( which is what I’m doing right now) is just not that good enough. My love for fashion comes with the care for every piece of clothing and accessory that I own. But I have never been successful in keeping all of my pairs of shoes looking brand new. I hate to see a pair of boots that has been used only once to go to waste just because I never wore it again and it was stuck in the back of the shoe rack. Also, the original boxes that shoes come in are not really what we would could call chic and stylish. That’s why I deserve to win Howards Store World Acrylic Shoeboxes, because they will take care of my shoes and make my whole closet look organized. Everyone really deserves to win as one of the people who commented here said. Everyone really does! Its just that, if I win these Howards Storage World acrylic shoe boxes, I will be giving it to my beloved, best Mom. Its the first gift I would ever give to her and I bet the BEST she would ever cherish. She will totally love it and she wouldn’t think twice in buying another set once she received one from you guys and has tested these Howards Storage World acrylic shoe boxes’ world-class design and quality that is one of a kind. Thanks and GOD bless us always! I deserve to win Howards Store World Acrylic Shoeboxes because my shoes is my best friend and a best friend needs to be treated like a princess. I deserve to win those Howards Store World Acrylic Shoeboxes…because a pair of shoes is worth storing and caring for. I deserve to win those shoeboxes because my shoes are just stashed under my cabinet waiting to be infested by i-dont-know-what creatures. Amen. I deserve to win Howards Storage World. I love collecting shoes! Imma shoe-addict :D And I treat them as my babies. 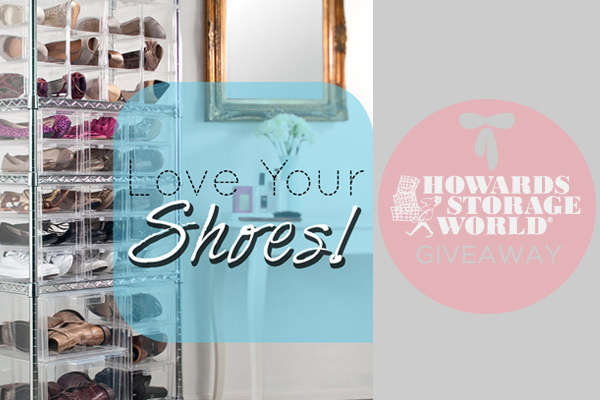 They deserve to have a perfect shoe organizer like Acrylic shoeboxes from Howards Storage World! I deserve to win Howards Storage World because I’ve learned the hard way that storage containers for shoes are nearly a necessity if you want to protect your footwear from dirt and dust. And since my footwear collection is always growing, I’m constantly on the lookout for new storage containers that will protect my shoes, while still giving me easy access and viewing. I deserve to win Howards Store World Acrylic Shoeboxes because I think my shoes also deserve to be well-treated, and so I’m gonna give them the right treatment using the Howards Store World Acrylic Shoeboxes. – I deserve to win the acrylic shoeboxes because I don’t want my shoes to get mixed up in the shoeboxes. I love my shoes too much to let them get cluttered inside the boxes. I deserve to win Howards Store World Acrylic Shoe boxes not for myself but for my mom. She has many shoes than mine ending up nakakalat around the house. Kidding aside, my times pa nga, natitisod kami because of her shoes. I deserve to win Howards Store World Acrylic Shoeboxes because I badly need convenience and in storing and finding my shoes. Imagine yourself waking up late for school and searching for your school shoes even adds pressure. Imagine your shoes having a free cockroach’s eggs inside. I am sure that Howards Store World Acrylic Shoeboxes contain the quality that I’m looking for and those will surely help my shoes last longer. Question: “Why do you deserve to win Howards Store World Acrylic Shoeboxes? Answer:It’s pretty simple.I deserve to win HSW because I know my shoes needs them right now and I know HSW is the best for my shoes that will probably give my shoes a proper care. I deserve to win Howards Store World Acrylic Shoeboxes because all of my shoes needs some BIG LOVE. I deserve to win Howards Store World Acrylic Shoeboxes because I love my shoes however I have no perfect place to put them to that makes them get easily dirty and cleaning them daily is a hassle for me. I deserve to win Howards Storage World because I’m really having a hard time in storing my beloved shoes. Usually “napapagalitan ako dahil ang kalat ng shoes ko”. I think that Howards Storage World is the best thing that I could receive especially it could lessen the spaces in your room. I deserve to win Howards Store World Acrylic Shoeboxes because I’m having problems with finding my shoes. I have shoeboxes piled on top of one another and it’s hard trying to find the pair of shoes I’m going to use PLUS it is time consuming. If I win this giveaway, I would easily pick the pair I’ll be using and will be stress-free on checking each shoebox I have. I deserve to win Howards Store World Acrylic Shoeboxes so i can organize my shoes better. Organized shoes means longer shoe life. Longer shoe life means less shoe expenses because i don’t have to frequently buy another pair. Everyone deserves to win. :) It’s just that I need those shoe boxes because I’m sick of our shoe boxes here since they all get mixed up and I need to open it all before I could see which one is mine. I deserve to win Howards Storage World because I really want and need this for my beloved shoes. And I believe HSW will provide me the quality I need for my priced possessions.